P.S. Be sure to enter my two current giveaway for Breyer’s Smooth & Dreamy (4 winners) and for the book Potty Animals (5 winners). Oh and TechyDad is also having a $25 gift certificate for ABC Neckties! You know we haven’t got the pool out one time this summer – I think I will remedy that this weekend! Looks like they were having a blast! Isn’t it great just kids just love water? TOo cute! Love the swim shirts! SO important these days! It’s been one hot and sunny summer for sure! my entry today is also having fun at the pool :) how cute! 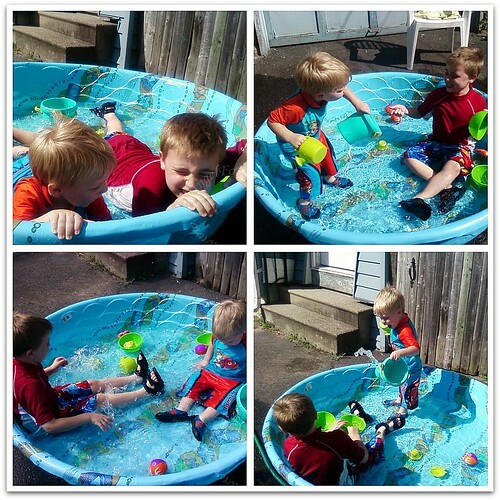 It looks like they’re having fun…kid pools are the best!